Chair in the Shade: Time for Books 'n Bloggers! Hey, it's time for my favorite swap! Chaotic Goddess' put on some amazing swaps throughout the year, but my far and away favorite is Books n' Bloggers. This is the swap where you send and receive three books. You send your partner a book off their reading list, a book you've read and think they'll enjoy, and a book of your choice. And they in return do the same for you. I don't know what I enjoy more- picking out three books for my partner or seeing what they pick for me. In the past, I've swapped with some awesome ladies, like Olive from A Book Olive and Stephanie from Wife, Mommy, Me. 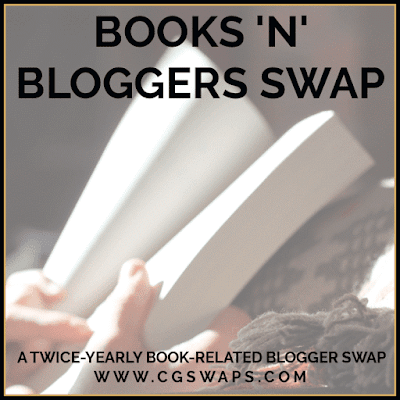 If you love books, and you blog, you really should join. Just head over to Chaotic Goddess' sign up page and fill out their handy dandy little form, post a post like this, and then just wait to be assigned your partner. And, is there anything I should be adding to my reading list? Give me a recommendation if you've read something good lately! This is so fun! I'm totally signing up! Fun! You won't regret it!